Royden Jandrell, the newsagent at this shop for 46 years, won a bravery medal for his part in saving a battleship. Royden (picture right) purchased the shop after serving in the Royal Navy in the Second World War. He was aboard HMS Rodney, a Nelson-class battleship. Rodney and her sister HMS Nelson were unique in British battleship construction, being the only ships to carry a main armament of 16-inch (406mm) guns, and the only ones to carry all the main armament forward of the superstructure. The guns had never been fired in anger for prolonged periods, and it was not known whether the ships were robust enough to withstand the stresses and strains that they would experience from sustained firing. Reputedly, the most powerful ship afloat during the war was the German battleship Bismarck. It wreaked havoc in the Atlantic in 1941 and, on 24 May that year, justified its reputation by sinking the pride of the British fleet, HMS Hood. The hunt was on for Bismarck! At 10pm on 25 May, it was spotted and attacked by Swordfish aircraft. A torpedo damaged Bismarck’s rudder, so the captain tried to sail it to a French port. Rodney sighted it at 2am on 27 May and opened fire at 8.50am. Rodney’s third salvo hit Bismarck from a range of 35km (22 miles), such was the power of the 16-inch guns. Bismarck’s 14-inch shells were falling short of Rodney’s position. The German ship was sunk at 10.10am by torpedoes from HMS Dorsetshire. Duri ng the engagement, the fears about the Nelson-class ships’ robustness came true. Rodney had begun to shake itself apart, and was taking on water. There were concerns that the ship could explode, if seawater reached the hot engines. Royden Jandrell (pictured left on HMS Rodney) and a fellow crew member volunteered to attempt to seal off the area around the engines. Their task involved swimming through the icy cold water below decks in total darkness to close watertight internal doors. Success seemed unlikely, and the volunteers were not expected to come out alive. However, they successfully sealed off the area and emerged unscathed. 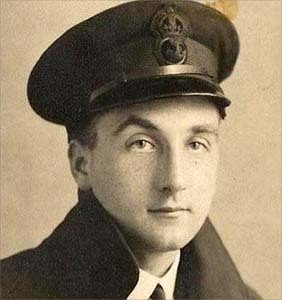 HMS Rodney was saved, and for his action Royden was awarded the Distinguished Service Medal. In 2012, Royden Jandrell’s account of his experiences on HMS Rodney were published by University of Plymouth Press in a book titled: Bismarck. The Chase and Sinking of Hitler's Goliath. Previously released accounts of the Battle of the Atlantic were by high-ranking Naval Officials, the War Office, the Royal Navy etc. 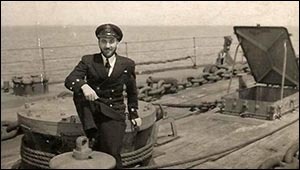 Royden’s account is the only one known to have been penned by an ordinary seaman who was there to witness the conflict.